Following on from my previous post, there are four main ways of preparing an index, none of them ideal. The traditional method is that, while you proof-read the text, at the same time you prepare a manual index, recording the entries with highlights or notes in the proofs, or keyed immediately into a text document. A modern variation on this method (which I personally favour) is to prepare the outline of the index (minus page numbers) beforehand and then fill in the page numbers by searching on a single PDF file of the book. Acrobat’s search functions are very useful here and of course the text you are working with is the real paginated book (I find that psychologically useful). The mark-up method involves entering indexing tags in the book file itself. This can be as slow a task as the traditional method but, when completed, the resulting index is instantly generated and with luck should not need a lot of adjustment (e.g. to divide a large number of single-level entries into groups of two-level entries). Index generation can even be re-run repeatedly in conjunction with adjusting the tagged entries until the index is perfect. The quick and dirty method commonly used is to create a concordance file (a list of words to be indexed) then let Word automatically generate the index from your book file. Though quick to create, this is not something I’d recommend; the resulting ‘index’ will be full of junk entries that you can spend days weeding out and it may lack entries that later you realise are necessary. In the end, then, this method may save no time at all. Just what you index is another issue of course, likewise how you structure your index. These are topics for later posts (or alternatively you can take a look at our book; there’s a lot more on the subject there). I have not yet started compiling an index for the book. Should I begin doing that already (a rough version), or can it wait for the time being? If I should start doing it already, how much space do we have for it and what indexing method do you suggest? An index may be unassuming, loitering at the end of your book with not a lot to say for itself. It is also one of the last things to be made, usually by the author, and often under great time pressure at the same time as the vetting of the second (paginated) proofs. Nonetheless, the index is perhaps the most-used pathway to searching a book, accessed far more times than the table of contents. A poor index signals to the reader that this is an inferior book. Do not fail your book at this last hurdle, mere days before it goes to the printer. You can prepare in advance by producing a mind map of the book that identifies elements you wish to include. From this, you could draw up a list of index entries (and sub-entries) minus the page numbers. As for choices in indexing method, see my next post. In an earlier post I discussed broad issues relating to word count and book length but didn’t actually explain how the length of a book is calculated. Let’s take a quick tour of copy fitting, casting off and related issues here. Which side of the equation? However, in your case (especially if you are self-publishing your book or a bit worried about having hassles with your publisher), it may be smarter to look at the equation from the other side – to calculate the likely number of pages resulting from the setting of X thousand words, Y tables, Z illustrations, etc. This is also known as casting off. Obviously, a prime determinant of book size is the word count. No matter how much you adjust the other variables, if the ms is only 50,000 words in length instead of 95,000, then you have a problem if the book was announced as being 288 pages in length but the most it can be stretched to is 160 pages. page size – academic books tend to follow a 9″ x 6″ (228 x 152 mm) format but the smaller traditional British Demy octavo format is also used a lot. font/typeface – some fonts fill a lot more space than others but obviously here as elsewhere readability and what publishers want are also important considerations. font size – this varies depending on font but usually it is between 10 and 12 points for body text, a bit smaller (sometimes much smaller) for notes. letter spacing (kerning) – you should assume this is set at 100%. word spacing – best to ignore as this is not easily adjusted. line spacing (leading) – usually 1.2 times the font size with any deviation from this needing to be handled with care. amount of normal text vs notes – as the font size for normal text is a bit bigger than for notes, the number of notes can have a significant effect on chapter/book extent. word length – MS Word only counts the number of words not their length, nor does it care if your language is full of bombast and excess syllables. But, apart from being harder to read (the subject of forthcoming posts on readability and simple English), such ‘flab’ demands much more hyphenation of your text and even then the result will be looser text filling a far greater extent than the word count would imply. chapter breaks – these can fall awkwardly (e.g. just before a new part that must start on a right-hand page) hence why it is more accurate to calculate the length of a book by its constituent parts than in the whole. elements of the book – all of these constituent parts must be considered (e.g. space allocated for an index, something not delivered with the main ms). sections – most books are printed on large sheets of paper folded and cut into 16-page sections. Part of the typesetter’s art is in ensuring that the number of blank pages at the end of the book is as low as possible. Feel overwhelmed? If you do, then you are not alone. However, the above list is for typesetting nerds not ‘real’ people. For your purposes, many of the above elements can be safely ignored or incorporated into a simple procedure, as you shall see. If you have a page-layout program like Adobe InDesign, then it is a simple matter to calculate how many pages your manuscript will fill by creating a dummy book and then tweaking its layout parameters. Otherwise, you can make a pretty accurate calculation of the length of your book by following the steps below. Determine the average number of words per page. Usually, this is about 400 for a standard academic book but only about 350 if the page size is Demy octavo. Changing the font, font size, leading, etc. will change this number a bit but, for your purposes, it is best to stick to these standard values. Assign actual extents to those book elements where this is known (e.g. the first 4 pages of the prelims are standard and – depending on if you have a dedication, how detailed are your table of contents, and if you have lists of tables and illustrations – you can also safely guess the next few pages). For the index, you can probably only guess at this stage but here too you need a value. Enter these fixed values in columns 4 and 5. Count the number of words for your preface, chapters, bibliography, etc., putting their values in column 2. Make sure that you include footnotes and endnotes (if using MS Word, by checking the appropriate box). Normally, it’s enough that you count these notes but obviously a lot of notes will skew your page calculation. Count the number of tables and illustrations for each chapter (and other element in your book), putting their values in column 3. Although they may be much smaller, the assumption here is that each table or illustration fills an entire page. We’ll adjust for this in step 8. 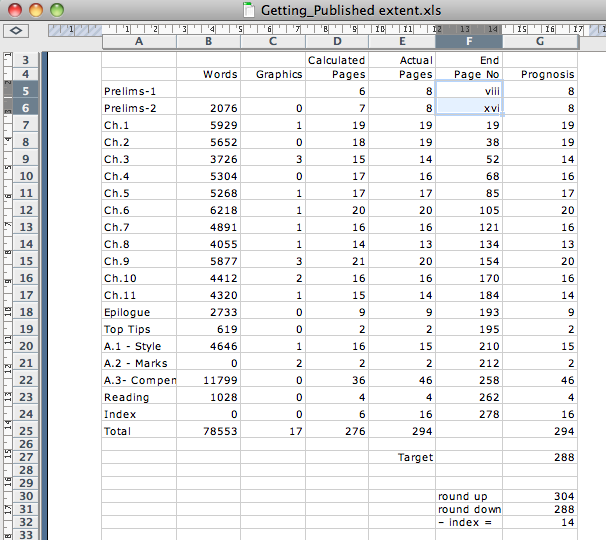 Calculate the (unadjusted) extent of your preface, chapters, bibliography, etc. To do this, divide the word count by the words per page set in step 3, add a whole page for each table or illustration, then round up to a whole number of pages. Enter these calculated values in column 4. Assess your calculated extents and put adjusted values in column 5. Reasons for doing this may be that some tables and illustrations are smaller than a whole page in size, there are a lot of endnotes (which will be set in a smaller font size), the chapter is followed by a part divider starting on a right-hand page, and the last page looks to be only a few lines long which could easily be saved in the typesetting. Calculate a running total by adding the adjusted values, putting the end page number for each element in column 6 (i.e. the end page number for Chapter 4 is calculated by adding its adjusted page value to the end page number for Chapter 3). The final page number (effectively, the book’s grand total) will appear in the bottom row, that for your index. Calculate the final extent (and number of blank pages at the end of the book). To do so, get the number of sections by dividing the grand total of pages by 16, then round up to a whole number of sections, multiplying these by 16. Ten steps – it’s a simple as that. Is the likely extent of your book too long? Too short? In most cases, if the variation in length is only about a section (16 pages), then it probably won’t matter. Your publisher’s production editor or typesetter may swear a bit and try to tweak the book design so that all the material does exactly fit the announced book extent. But, if s/he fails, it is more than likely that your publisher won’t even blink at this slight variation. However, if your book is likely to be significantly over or under its contracted/announced extent, now is the time to start sweating and thinking hard about how to retrieve the situation. Serious chocolates for your editor may be in order, but this may not be enough. You are currently browsing the GETTING PUBLISHED blog archives for September, 2009.